Android Nougat 7.1 ROM, LineageOS 14.1 for Galaxy NOTE 10.1 LTE (2014 model) has now arrived via an UNOFFICIAL build. 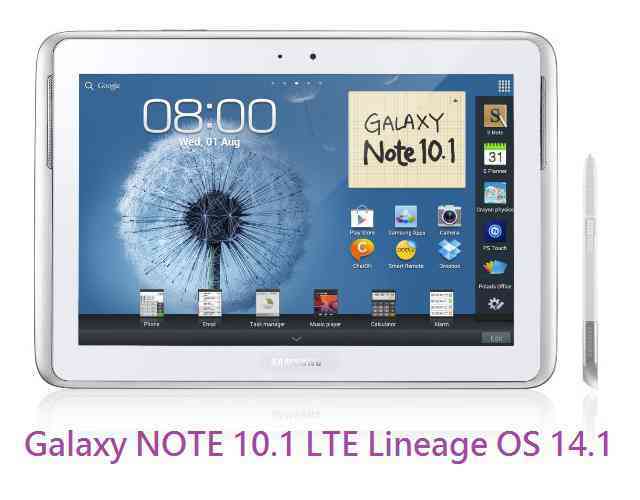 Also, here comes the Lineage OS 15 for Galaxy NOTE 10.1 LTE 2014, which you can try. If you want some more Lineage ROMs or wanna taste the OFFICIAL Lineage build then stay tuned to the Lineage OS 14.1 ROM collection page. THIS IS AN INITIAL BUILD WHICH MAY NOT BOOT AT ALL. HAVE A BACKUP BEFORE FLASHING THIS AND TRY AT YOUR OWN RISK. Installing a custom ROM on a Galaxy NOTE 10.1 LTE (lt03lte) may require the bootloader to be unlocked, which may VOID your warranty and may delete all your data. Before proceeding further you may consider backup all data on the phone. You are the only person doing changes to your phone and I cannot be held responsible for the mistakes done by you. – Here is the TWRP update guide for the Galaxy NOTE 10.1 LTE 2014 (lt03lte). Download and Copy the GApps and LineageOS 14.1 for Galaxy NOTE 10.1 LTE ROM ZIP to your phone. First flash the Lineage OS 14.1 for Galaxy NOTE 10.1 LTE ROM ZIP from device. Then flash the GApps zip from your device memory. DO NOT REBOOT yet. Then flash the LineageOS 14.1 Nougat GApps package. Reboot and Enjoy the Nougat 7.1 LineageOS 14.1 ROM for Galaxy NOTE 10.1 LTE (lt03lte). Copy the latest Lineage OS 14.1 for Galaxy NOTE 10.1 LTE ROM ZIP file to your phone. Stay tuned or Subscribe to the Galaxy NOTE 10.1 LTE 2014 (lt03ltexx) forum For other Android Nougat ROMs, Lineage OS 14.1 ROMs, other ROMs and all other device specific topics. Hi, I am quite happy with the ROM 14.1-20171214-NIGHTLY-lt03lte. Thanks a lot the developer(s) ! Just one issue I have got: Some apps recognize the external SDcard (like SolidExplorer) but some not i.e.Dropsync, Picture Gallery. The latters need the root folder of the external SDcard which should be somewehere in /storage/. However if I search for the folder in that ROM I find it in /mnt/… where it can not be accessed by such apps like Dropsync/Foldersync. Might there be a solution ? Just one issue I have got: Some apps recognize the external SDcard (like SolidExplorer) but some not i.e.Dropsync, Picture Gallery. The latters need the root folder of the external SDcard which should be somewehere in /storage/. However if I search for the folder in that ROM I find it in /mnt/… where it can not be accessed by such apps like Dropsync/Foldersync. Might there be a solution ? See if there is an option in the app (Dropsync/Foldersync) to manually select the external SDcard location. If not, then I think the following can help you !! If you know the exact location which the Gallery app is searching for the external SDcard, then you can always create a soft link to the original location. If /mnt/… is the actual location of the external Sd card mount point… but the App (Dropsync/Foldersync) actually searches the external SD card to be at, let’s say: /storage/… which is not present at this point. – You need to run the command to create the soft link on every boot.